Thank you for such insightful words and ideas…so important! Hi Kathy, thanks for doing your part too! TV, social media, newspapers,…, so much trouble on them, we need to turn them off and focus on work and on the good stuff we can do to help others and ourselves. Great post for this moment. Yes, sometimes it’s hard to turn off the drama, but so necessary! 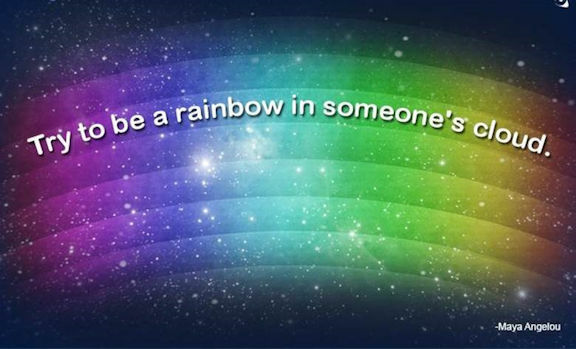 Beautiful thoughts in your image … a rainbow bright with hope and laughter. Glad you enjoyed it, Isadora! Enough is enough —- time for some positive output!! Your quote is part of “perfect timing”! !